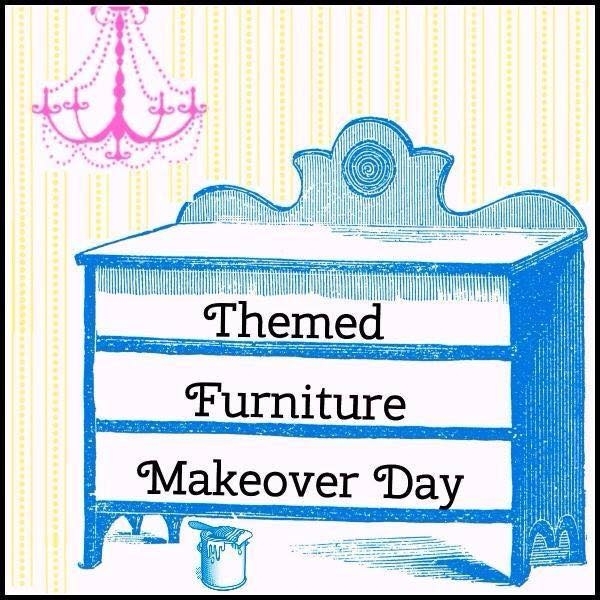 It’s time for another Themed Furniture Makeover Day! If you’re new around here, each month me and some super talented furniture painters get together and share a piece we created based on the same theme. And this month was…DISTRESSED! You can check out last month’s, which was chairs, here. This little lady, who I’ve named Scandy, has so many fun elements I love about her. But let’s start with how she looked when I rescued her from the depths of a dark, dingy thrift store. Oh those lines…so purty. But that color…not so much. 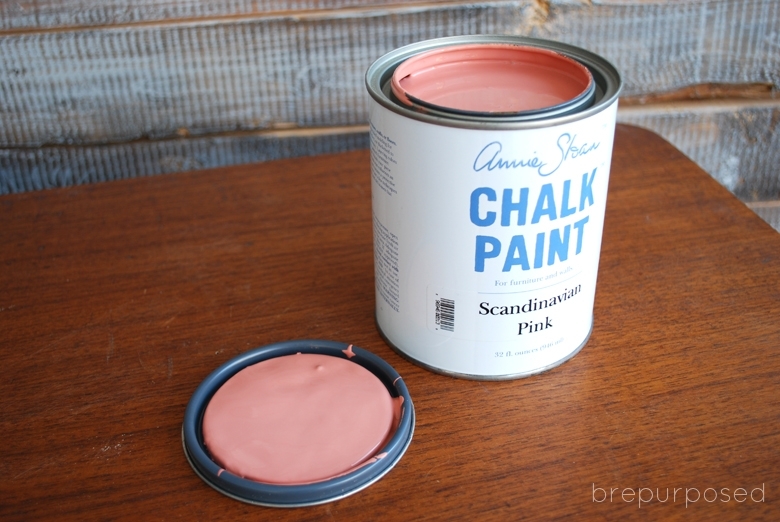 I had picked up some Scandinavian Pink® which I’ve never used before and knew this would be the piece to try it out on. But I didn’t want that ugly yellow color showing through when I distressed it. I had some Graphite® left over from a while ago and thought it would be perfect to layer that underneath it to give it some more depth. So gorgeous, right? After giving Scandy a quick wipe down, I applied one coat of the Graphite®. I followed that up with two coats of the pink and started distressing once it was dry. I got nervous when I started seeing some of the yellow sneaking it’s way through, but I actually think it adds even more depth and love the variety of colors you can see. Once I was happy with the amount of distressing, I sealed her up with some Clear Wax. Now I swear every time I go to Hobby Lobby, their hardware collection keeps growing. And it’s awesome. I was immediately drawn to this knob and could have saved myself the 20 minutes of staring and being indecisive if I had just gone with my gut in the first place. This amazing paper is from Spoonflower and I could honestly spend hours on their site rifling through all the amazing patterns. AND you can upload your own design and create your own. Which you KNOW I’ll be doing. That print was one of my freebies a while ago which you can print out here. 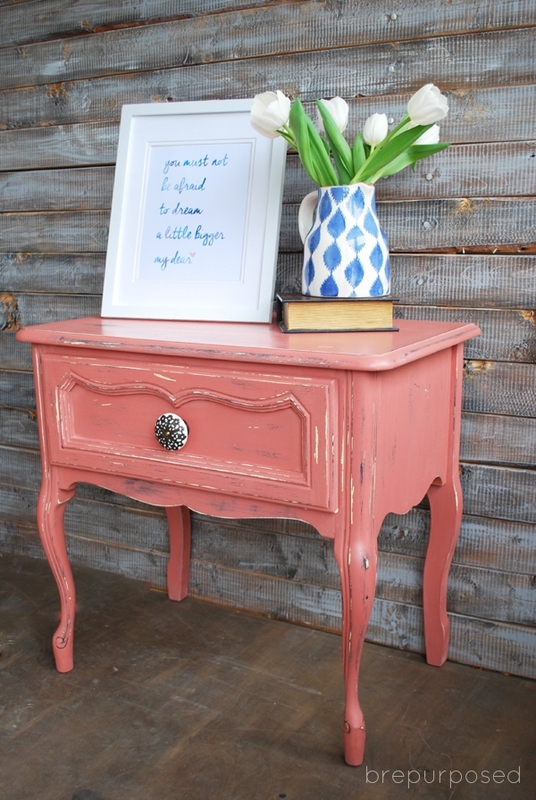 Be sure to check out all the other fabulous distressed projects below! Have a wonderful day friends and don’t forget to vote for my Klein Blue Cabinet in General Finishes’ Design Contest HERE. Gorgeous! Do you do anything to the paper? Mod podge? Glue it inside? Or maybe it’s sticky to attach? 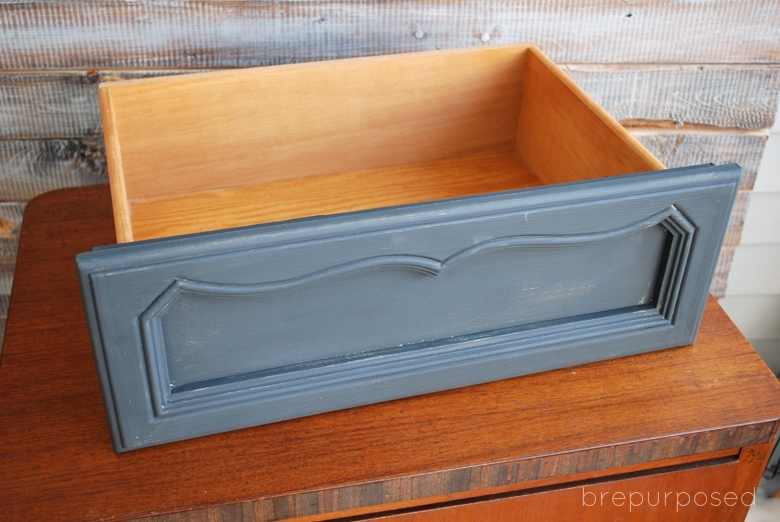 I’m redoing a desk and hoping to cover the inside of some drawers too. LOVE THAT PINK! Such a beautiful transformation. I’m so excited to be a part of this amazing group! Adore that color! 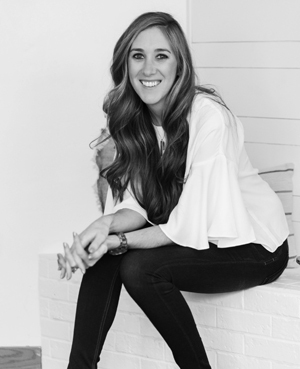 Thanks so much for the inspiration and sharing on Show Me Saturday! So gorgeous Bre! I love the scandinavian pink and that knob!! 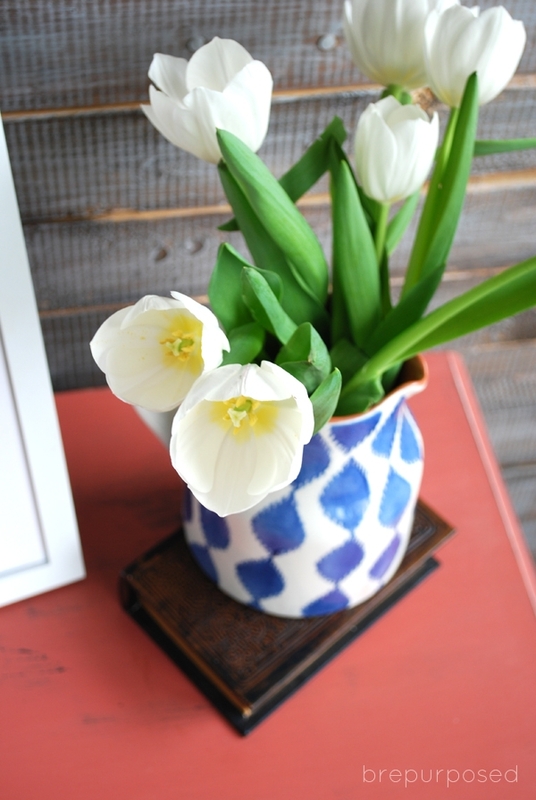 The little vignette is equally gorgeous. Thanks so much for sharing at The Creative Circle! i love how this turned out! that color is so pretty paired with those legs! You’re so sweet, thank you Sarah!! I love Scandy!! The little bits of gray and yellow peeking out go perfectly with that pink. Love the knob too! Oh I’m in love with that color! Beautiful makeover! How pretty!!! 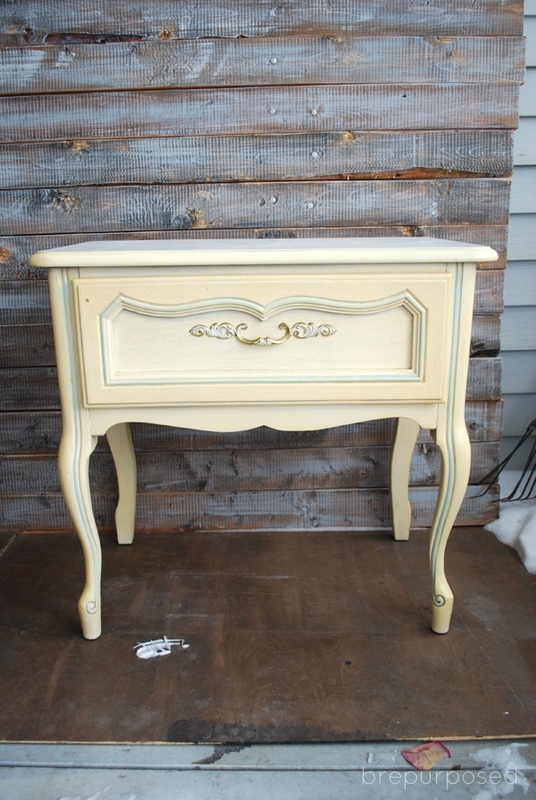 What a great makeover, LOVE the color you picked, and the finish you created! Love the inside of the drawer too! So cute! This looks so sweet Bre! 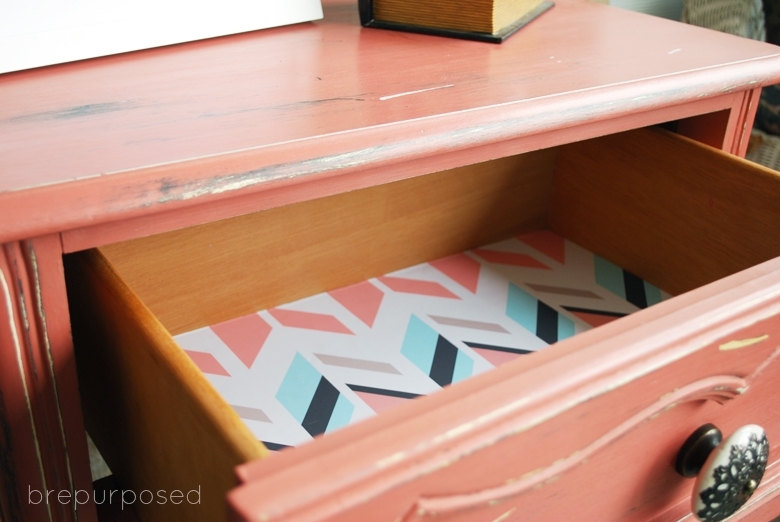 I love the paper in the drawer! Love how pretty this project turned out and the color you picked. Just beautiful! I’m in love with that color choice! Thank you so much Carmen!! This turned out perfect! 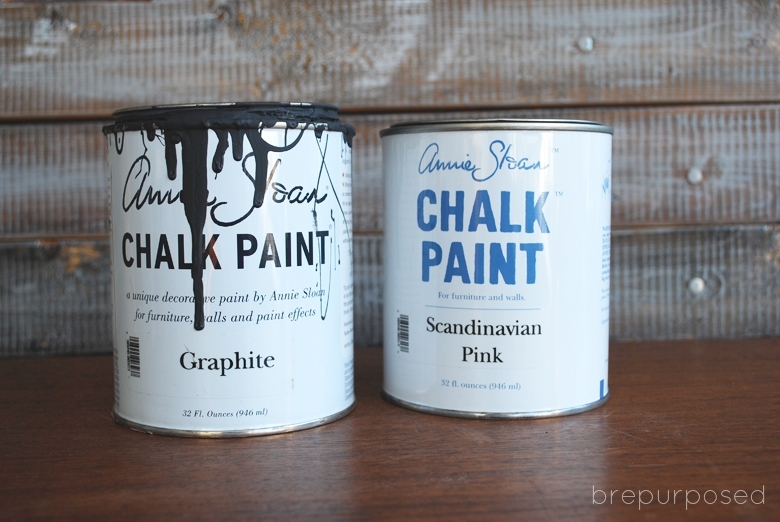 I’ve not used this color of Chalk Paint™ before and now I want to. Love your choice of knobs as well! I also have a collection of HL hardware, it’s hard not to with all the fun choices! Thank you so much Melody! I love experimenting with new colors 🙂 And Hobby Lobby knobs are definitely my weakness! Love the layers and love the colors Can I take this home?? Beautifully done and beautifully staged for the photos! Just awesome! BTW-Lucky you with a Hobby Lobby nearby. Ours is almost 2 hours away! Thank you Wendi! She’d be all yours if you lived nearby 🙂 And that’s such a bummer your closest Hobby Lobby is that far away! I don’t know what I would do without it! what a precious color. 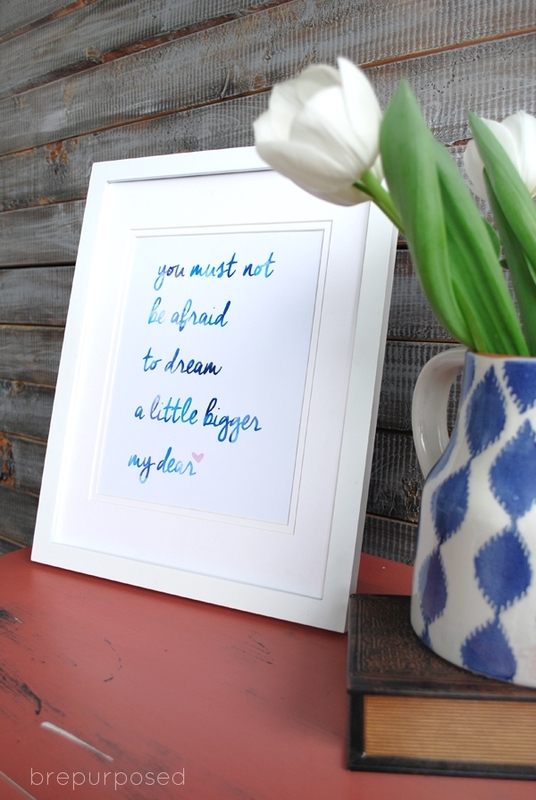 I love how you paired it with the blue decor, It’s really a new stunning piece! LOVE the color! What a great update. So wish I had more time to do furniture! She looks beautiful! I have a serious problem with staring at the knobs at Hobby Lobby for way to long, too! Perfect choices on colors. I spend WAY too much time in that aisle! haha. Thanks Jenny! Thank you Christy! You should definitely try it out, it’s such a beautiful color! I am soooooo happy I’m not the only one that names my furniture! I get strange looks from my son when I mention “who” I’m working on. Very cute piece! haha you are definitely not the only one 😉 Thanks Charisse!! Ooh I just love it! That Scandinavian pink is just so swoon-worthy. And I like that the yellow shows through along with the dark gray – definitely more multi-dimensional! Thank you Erica! It’s fun playing around with layering, you never know how it’s going to turn out! aw thank you so much Jeanette!! I also not a huge pink fan but am totally in love with this color! Thanks Christy!! It’s actually Gift Wrap and I just use a spray adhesive to get it to stick to the drawer 🙂 I could spend hours on Spoonflower’s site, they have so many amazing patterns! What a pretty color! I love how distressing with the layered paint gives this piece character. The pretty knob and paper are the icing on the cake for this piece. Thank you Paula! I’ve only played around with layering a couple times but I love the depth it gives a piece! 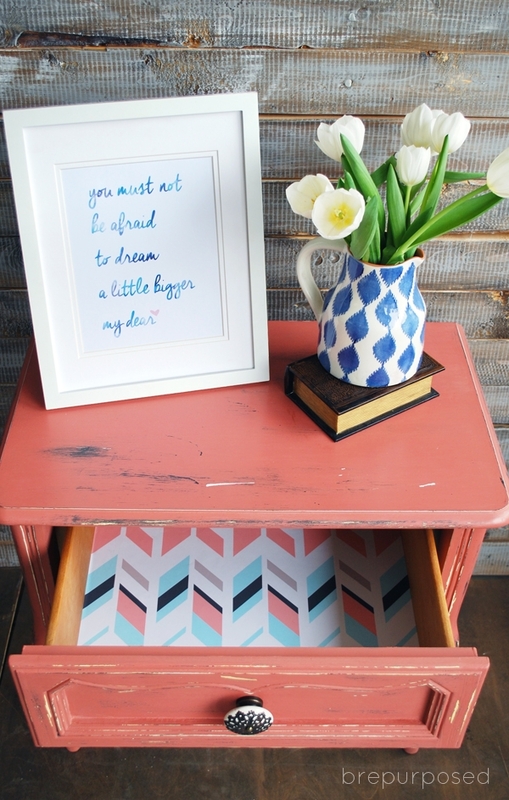 Finding pretty accents is always fun too! Oh Bre, SO pretty! 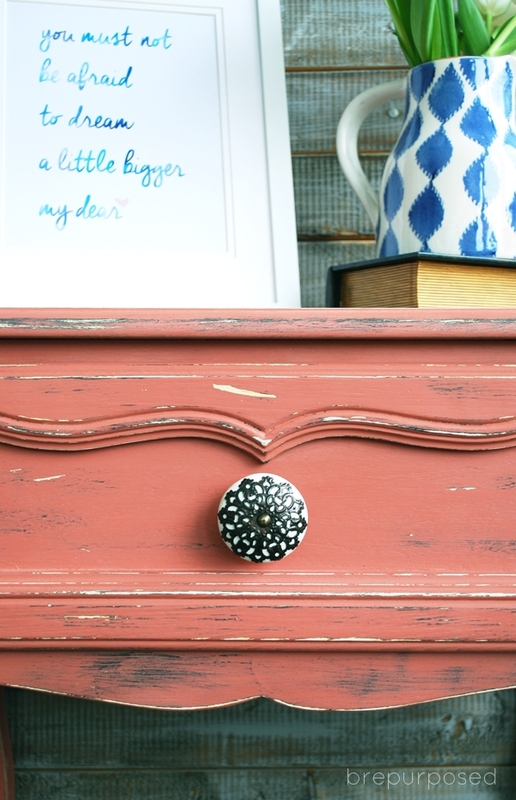 LOVE the colours peeking through and that knob couldn’t be more perfect for this piece!!! 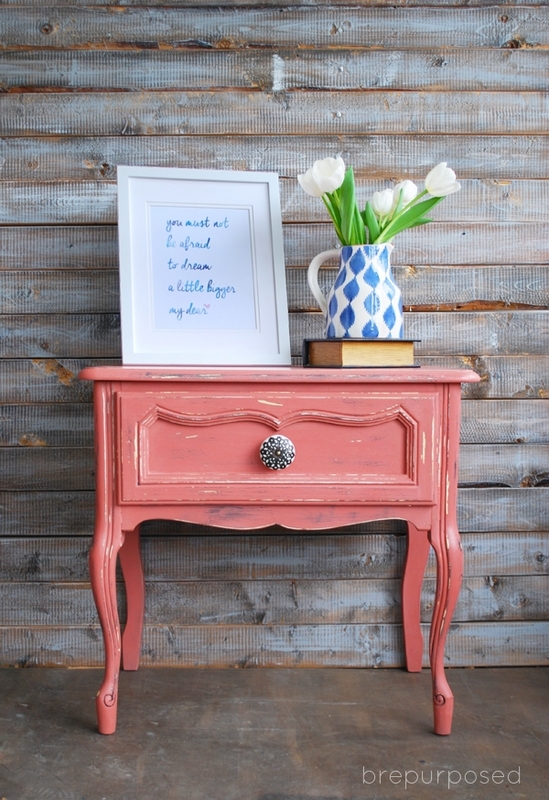 What a difference some Scandinavian Pink and a pretty knob made to this table. Bre you couldn’t have found a better paper to the line the drawer with – perfection! Isn’t that paper gorgeous?! I spend quite a while on Spoonflower’s website before I found it haha. Thanks Marie! This is beautiful! I love that pink color. What do you do with all these pieces you are making over and where do you find most of them? Just curious. Hope your week has been great so far. Thanks Larissa! It’s such a beautiful color, I can’t wait to use it again! Ahh, the infamous knob aisle at Hobby Lobby, gets me every time! I was just there on Saturday and couldn’t make up my mind either. You definietly made the right choice with the knob and paint combo! This piece would look so cute in a little girls room. Great job! I spend FAR too much time in that aisle haha. Thanks Katie!! 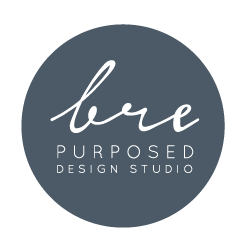 Love it Bre! That color is beautiful! Does this pink look good with other shades of pink in the room? I have a little light pink and hot pink. Yes it would look great with a mix of pinks!